Younger South Koreans tend to be “national security conservatives,” and their social media posts reflect this. Katherine Moon, a senior fellow at the Brookings Institution, observed in a recent interview on Japan-South Korea relations that “South Korea is one of the most militarized societies in the world.” Given its perception of vulnerability and the prerogative of nation building (and nation maintaining), conscription in South Korea has been mandatory since 1965. 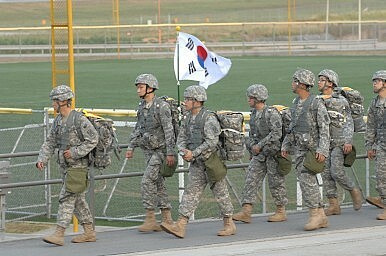 The current Conscription Law, although modified several times since its implementation, is still a defining characteristic of South Korean society. Among other studies, Seungsook Moon’s Militarized Modernity and Gendered Citizenship in South Korea explores the politics of belonging and identity in South Korean society. Moon shows how an anti-communist national identity was cultivated and men instrumentalized by the state through mandatory conscription. Women were treated as reproducers of the nation – a “good wife and wise mother,” as the saying goes. While the growth of South Korea’s civil society, and efforts to make a more inclusive, less-militaristic society have somewhat succeeded, it would be wrong to suggest that South Korean society is no longer militarized, as Katherine Moon points out. Indeed, as I argue in my comparison of theatrical reproductions of Ahn Jung-geun and the Clint Eastwood film American Sniper, both South Korea and the United States share the common characteristics of glorifying battle and valorizing violent struggle. Some notable effects of South Korea’s militarization may have shown themselves in some of the responses to North Korea’s most recent provocation. A Chosun Ilbo article from August 23 showcases messages posted on Facebook and other SNS from military reservists in their 20s and 30s (service in the reserves is compulsory for a number of years following the end of mandatory service). The messages underscore what seems to be an eagerness among young South Koreans to defend the republic against a bellicose North Korea. It is yet to be seen whether the militaristic attitude reflected in the online comments and the broader conservative attitude among young South Koreans is a new normal. It is, however, something to closely watch.